IASbet Mobile is one of the top Australian sports betting apps, offering over 200 markets across the Australian Football League, National Rugby League, horse racing, cricket, golf, soccer and many other sports. IASbet is now part of SportsBet. 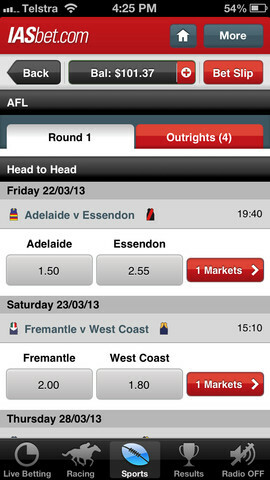 CLICK HERE to read our review of the SportsBet app. Versions for iPhone, iPad, Nokia, Android, Blackberry & Windows Phone. 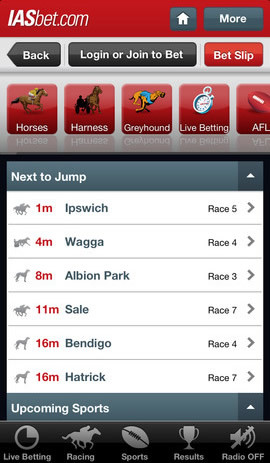 Place mobile bets on Australian Horse, Harness and Greyhound racing. Strong focus on AFL, NRL, golf, cricket, tennis rugby union, hockey & politics. Make a deposit of $50 and receive a $100 free bet when you place a bet. Also features racing from UK, South Africa, Hong Kong, Singapore and Ireland. Coming out of the Northern Territory, Australia, IASbet has more than 30 years’ experience of bookmaking and wagering. Historically specialising in racing in all its forms, it now offers a complete range of wagering on sports markets and operates in partnership with Paddy Power to provide a wider range of markets and bet types. Now turning its attention to mobile services and wagering on the move, IASbet has a recently developed mobile site and apps available for download free on iPad, iPhone, Android and other devices. With a variety of joining promotions, bet bonuses and offers available, sports fans wanting a wager on the move, both Down Under and around the globe, are well catered for. 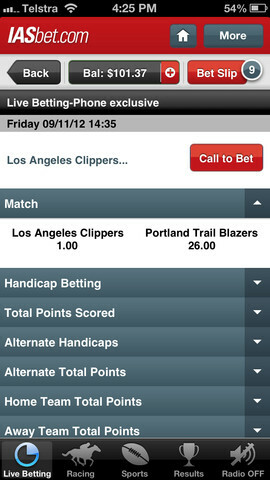 Live in-play betting is available on sporting events from around the world. The options are extensive, although a drawback is that punters wanting to bet on in-play events are required to call up to place their bets (online betting during live sporting events is prohibited by government legislation in Australia). Traditionally IASbet are racing specialists and their coverage of horse racing, harness and greyhound racing is extensive. Punters, however, can bet on pretty much any sport from around the globe, although the site naturally has an emphasis on Aussie sports and markets. The Paddy Power partnership is also evident from the availability of bets on non-sporting matters as diverse as the first country to leave the Euro and the name of the person that cuts the umbilical cord of William and Kate’s baby. A staggering array of bet types are available to entice everyone from the casual punter to the big stakes pro, particularly for racing fans. Betting products range from Super6s for those looking for the winners of 6 consecutive races around the courses and Lucky Loser wagers on horses that will not run a place. Exotics include Exactas and Quinellas, Trifectas and Flex bets. IASbet claims to operate on the slimmest of margins resulting in better odds for its customers. It also offers a number of special offers on sports and race betting. A typical promotion is a 10% bonus on win only bets (10% of winnings less stake) up to $100 per account. For residents of Australia only (excluding Victoria residents, for reasons unknown), a $100 free bet bonus is currently on offer for new members opening an account. Unlike many other joining offers, the IASbet promotion is refreshingly uncomplicated. Simply sign up via the website, make a first deposit of just $50 or more and a $100 free bet will be deposited to your account within 24 hours. Your initial deposit must be within 30 days of registering and your free bet used within 30 days of receipt. The free bet must be wagered in its entirety, which, as far as terms and conditions go, is straightforward and does not require initial deposits to be wagered a number of times before the free bet can be accessed. A similar offer is available to new customers (again resident in Australia) in the form of a 20% signing up bonus. For those depositing a minimum of $150, a 20% bonus is available up to a maximum of $200. Similar terms and conditions apply, but the offer is obviously an attractive one for those intending to deposit a significant amount on opening their account. For international customers not resident Down Under, a welcome sign up offer is also available. 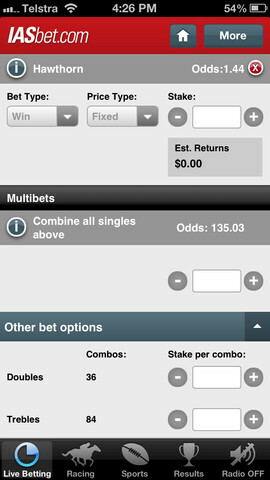 The same terms and conditions apply as to Australian residents joining save that the free bet on offer is $50. Finally, a refer a friend offer is on promotion. Always a nice option, this offer promises to credit your account with a free $50 bet for every friend successfully introduced. Provided that you have placed a bet within the preceding 60 days and that the friend you have referred has a $20 turnover in settled bets on their account, you will receive your free $50 bet within 72 hours of the conditions being met. Your friend will also be credited with a bet match up to $50 on their first bet. Customer service queries and account management issues can be dealt with via telephone, email or live chat. Dedicated numbers are available for international customers, although an obvious disadvantage is that lines are not open 24 hours a day. The IASbet mobile site and apps provide a simple and accessible betting experience for those wanting to punt on the move. What it lacks in features it makes up for in the range of markets and bet types available. Thanks in part to its partnership with Paddy Power, IASbet is truly international in scope, although punters with a particular interest in Australian sports and markets have the broadest range of betting options. Boasting competitive odds and an attractive array of betting offers, as well as generous and uncomplicated introductory offers, IASbet is a solid choice for punters wanting a straightforward wagering experience.